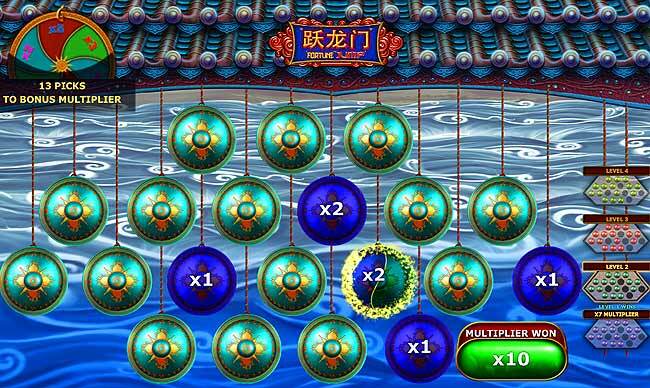 Fortune Jump offers some new style fun in a slot machine game. 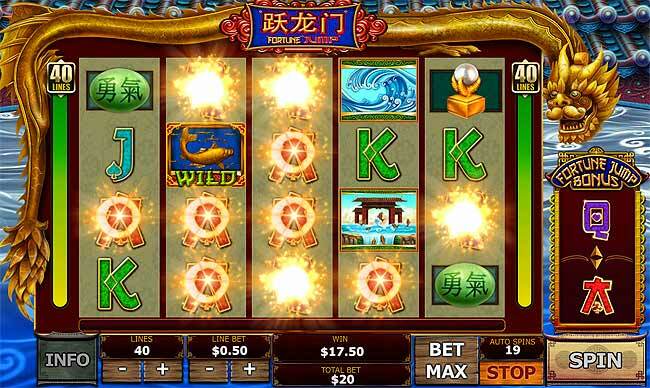 This is a chinese styled video slot with a couple of great features set to increase your chances of winning big jackpots. The game has 5 reels with 4 visible symbols on each reel giving up to 40 paylines. You have full flexibility on your bet. You can choose the number of paylines to play and the bet size for each line. Regular game play is simple, just spin the reels and hope for matching symbols on an active payline. The game offers two great bonnus features. The first is the FORTUNE JUMP BONUS. This can trigger at random when you get a payline win with 4 or more matching symbols. When this happens the card on the right of the reels will be revealed to show two game symbols. Any of these symbols on the reels will swap with each other. You get pais for the first win, and then when the symbols have swapped there maybe more even bigger wins and you get paid for these aswell. The next bonus game is the big multiplier bonus. This is a multipart bonus and will trigger when you spin 3 or more FORTUNE JUMP logo symbols. You are face with a screen showing 20 shields. Behind each shield is a multiplier, a multiplier with level progress, or a collect. Pick a sheild and reveal its hidden contets. Keep picking until you hit collect. There are four levels to pass through. With each level the multipliers will get bigger. If you reveal 18 multipliers, from the 20 shields, without hitting a collect you are faced with the final stage 2 of the bonus. This sill bring you the FORTUNE WHEEL. Each multiplier from the intial shield picks are added together to give a total multiplier. The prize is you total bet times by your total multipliers. The final FORTUNE WHEEL with the give you a top up multiplier of this total. This game can win you huge amounts of cash in the bonus game. It has been known to collect multipliers of 300x or more.